Here at Percy Nobleman, we all agree that looking sharp, and feeling your best come hand in hand. Combing your hair each morning is a fundamental part of everyman's grooming routine. Leave the house without doing it? We wouldn't dream of it! This comb is handmade from soft, yet sturdy black rubber which is kind on your scalp. It won't pull or snag on your hair, making combing your hair an enjoyable and stress-free experience. A perfectly sized comb, the teeth are specifically rounded to avoid unnecessary irritation ensuring that you get the very best experience from each use. The two widths to the teeth allow you close control for even the most demanding styles. This comb is the perfect companion for all gentleman when on-the-go. It makes maintaining your natural style a breeze. It's superior construction will make sure it lasts time and time again. 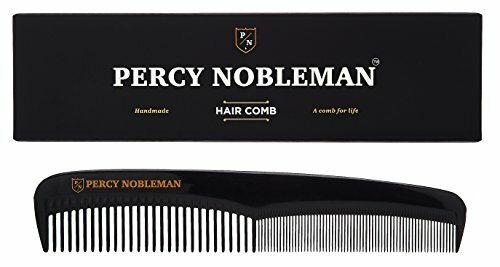 If you have any questions about this product by Percy Nobleman, contact us by completing and submitting the form below. If you are looking for a specif part number, please include it with your message.